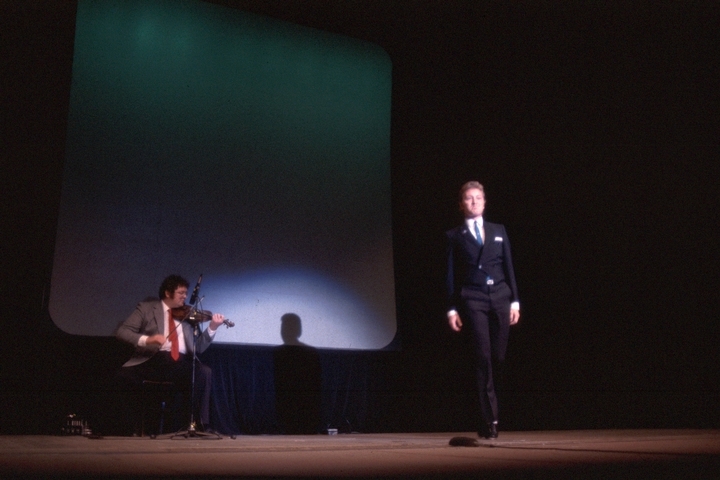 Michael Flatley's parents, emigrants from County Sligo, Ireland, instilled in their children a love and respect for the traditions of their homeland, especially music and dance. Michael learned from his mother the rudiments of Irish step dance, a highly stylized form in which the upper body is held rigid, the arms vertical at the sides, while the legs and feet perform with athletic and rhythmic virtuosity. At the age of 11, Michael tried to take formal lessons but was told that he was already too old to learn properly. He moved the cars out of his parents' garage in the Oak Lawn suburb of Chicago and spent hundreds of hours there learning the basic steps and practicing. "And then I started adding my own steps," he said. "It was the only way to win. The Irish kids eat, drink and sleep step dancing, and they are way ahead of anyone else." Irish step dancing is indeed highly competitive. Contests begin at the local level and work up to national competition, ending in the annual All-World Championships in Ireland. 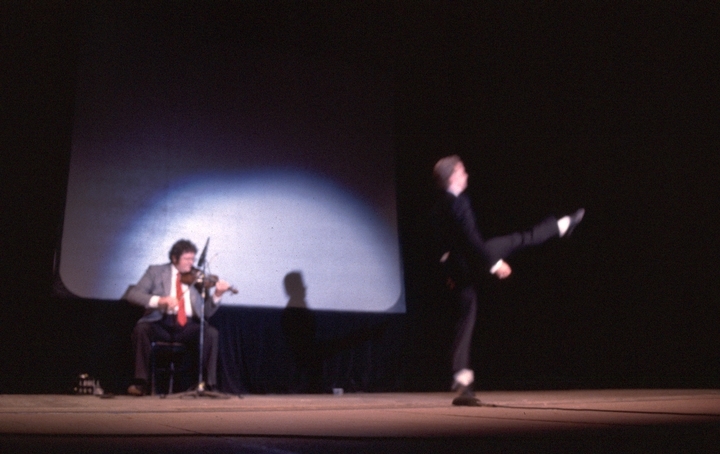 Flatley is the undisputed champion of modern Irish step dancing. At 17, he became the first American to win the title of All-World Champion at the annual international competition in Dublin. He also gained a major position in the field of Irish flute music, winning the All-Ireland Concert Flute Championship for three consecutive years, 1974-1976. In 1978 he retired from general competition as a musician and dancer, having compiled an unsurpassed record of technical and aesthetic excellence that included 168 first-place championships. 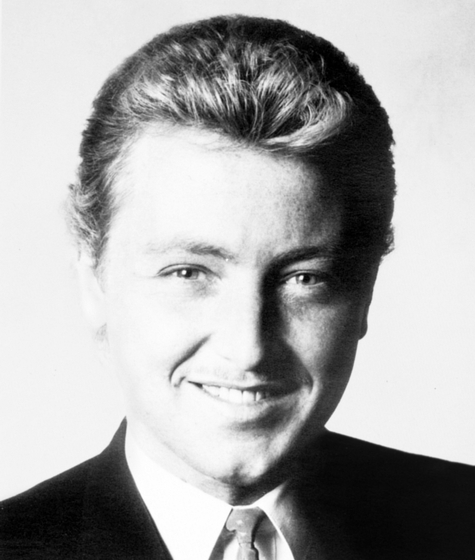 Flatley was a Golden Gloves boxing champion as well and considered becoming a professional boxer. But an offer from the Irish musical ensemble the Chieftains made him reconsider, and he joined the group for a worldwide tour. 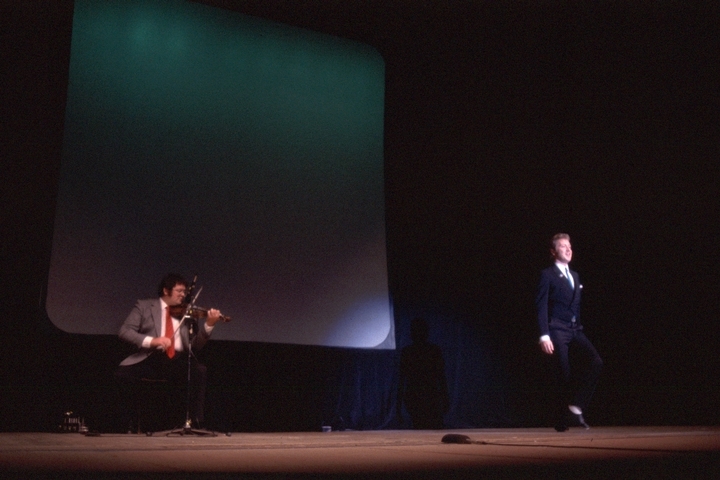 "This guy said he saw one of my performances," Flatley recalled, "and he wants to know: 'How would you like to dance with the Chieftains?' I just couldn't believe my ears. My heart started to beat real fast and my hands started to shake. The Chieftains are the greatest Irish musicians in the world.... I told him I would be honored. So I gave up the boxing idea." Over the years, Flatley became renowned for an innovative dancing style that combined jumps of astonishing height, dazzling scissors kicks, lightning-fast footwork and complex rhythmic syncopation. In 1989, he challenged the Guinness Book of World Records in the category of the number of taps one can sound in one second. The former world's record was twenty-four per second; Flatley managed twenty-eight. When asked about his performing, Flatley said, "I wonder if my legs are going to be there when I get down.... I'm definitely setting out to prove that I'm still the best dancer in the world." In recent years Flatley has returned to the stage and released videos of his performances but announced in 2015 that he would retire because of a variety of physical injuries. Aloff, Mindy. "Hot Eire." New Republic (June 16, 1997) 216, 24: 29. Barnes, Clive. "Did Your Mother Come from Ireland?" Dance Magazine (June 2000) 74, 6: 98. Bellafante, Ginia, and Julie K. L. Dam. "Mr. Big of the New Jig." Time (March 31, 1997) 149, 13: 76. Duffy, Martha. "Not Your Father's Jig." Time (March 18, 1996) 147, 12: 88. Fanger, Iris. "Lord of Irish Dance, Michael Flatley." Christian Science Monitor (March 26, 1997) 89, 183: 13. Gladstone, Valerie. "The Man Behind the Duel Between Irish Blockbusters." New York Times (March 2, 1997): H8. Hitchner, Earle. "Michael Flatley. Lord of Irish Stepdancing." Wall Street Journal (March 13, 1997) 229, 50: A12, eastern edition. Lampert-Greaux, Ellen. "Celtic Pride." TCI: Theatre Crafts International (March 1997) 31, 3: 6. McCourt, Frank. "Gotta Dance." The New Yorker (March 10, 1997): 37. McNamara, Devon. "Riverdance Shifts Irish Dancing into High Gear." Christian Science Monitor (December 9, 1996): 13. Parry, Jann. "Celtic Crossover." Dance Magazine (October 1997) 71, 10: 70. Tresniowski, Alex, and Vicki Sheff-Cahan. "Gael Force." People (April 14, 1997): 135. Flatley, Michael. On a Different Note. Unicorn Entertainments Inc./IMS CD (flute music), 2011.